Barnesmania - Paisley's opinion on John Barnes - LFChistory - Stats galore for Liverpool FC! John Barnes' individual talents have never been in doubt. You do not require an in-depth knowledge of the game of football to work out that he is one of the most gifted players around. You do not need experience of coaching or management to pinpoint his potential for causing havoc and damage to opposing defences. 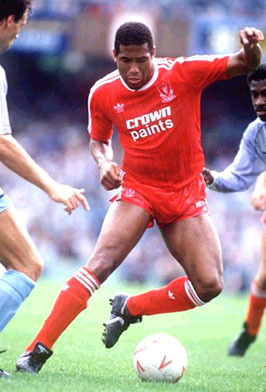 It does not take much to get excited about John Barnes. But if he is so exciting, so talented, so dangerous, why were so many people surprised that Liverpool wanted to sign him so badly? Could it be they saw no place for one of England's top individuals in England's most revered team? Did they maybe think that a top-of-the-bill entertainer like John would be too loud and flamboyant for the quiet, efficient Anfield trophy-winning machine? Well let me tell the doubters, our machine runs on talent, and John's undoubted talent will only serve to make it faster. Even if he never gives another pass to colleague, John's very presence is now benefitting his team-mates. Opponents are painfully aware of what he can do to them. One or two of the sides that we have come up against have unashamedly detailed a couple of men to mark him. They make no attempt to diguise their number one priority...'keep John Barnes quiet'. As soon as that kind of special attention is given to the containment of one player, you should be able to look around the field and see his ten team-mates rubbing their hands with glee. If you slam one door in the face of a good team, another two should immediately fly open. If they send a posse after Barnes, then Aldridge and Beardsley should be able to sneak away the loot. That's team-work. But Kenny didn't sign John to be a decoy for others, or to be some kind of side-show to keep us entertained whilst the rest are getting on with their jobs together. He signed him because he had a clear picture in his mind of how the Barnes repetoire could benefit his team, and be a working part of it. John is naturally left-footed... I think. It is not always easy to tell because he seems to have enough pace to stick the ball to either foot when he is dribbling with it. But he is very much at home on the left-wing. You don't have to be a "leftie" to play on that side. Ray Houghton is essentially right-footed, but he has played a lot of First Division football down the Oxford left, and years ago Liverpool had a right-footed left-half called Bob Paisley. But if you were choosing a left-winger from two evenly-matched players, you would go for the left-footer rather than the right-footer. That's logic, not management. John gives us the sort of balance that Ray Kennedy gave my team in the late-seventies. He is good enough to play in any one of a number of different positions, and will wander inside during a game to strike at the heart of an opposing defence. But when he is standing with his heels on the left-hand touchline, he is not only capable of getting behind a full-back, he is giving our attacks a width and a shape which others find it more difficult to provide. When he has the ball at his feet, it stays there. His control of it is one of the most natural things in the world to him. I am sure that if you asked him to explain his technique or teach it to somebody else, he would find it difficult. Running with the ball comes as easily to him as running without it. It makes him terribly difficult to tackle because there never seems to be even a split second when it is up for grabs to a defender who can stick in his foot quickly and nick it away. To make the opponent's task more difficult, John is also physically strong. He can survive the bumping and buffeting without checking his stride. He can look after the ball and himself too. Few challenges do anything to disturb his balance. He can sway and swerve either way, and you can't see it coming. Many players give indication when they are about to change direction like a car, or sometimes a double-decker bus. But John can beat you by stealth as well as power or pure speed. I hope that impressive frame of his is ready for sixty games a season. He is going to find the Liverpool schedule very different from the one he was used to at Watford, particularly if he becomes an England regular. But he is a most confident and likeable young man who has already handled the various pressures surrounding the move with a calm assurance. The supporters have taken to him instantly. The award of a free-kick to Liverpool is now a major event at Anfield. There is an excited chatter about the place as he strolls forward in his casual way. His accuracy with a dead-ball is another great bonus for us. He has already scored some great goals and seems to revel in the pressure that comes with constantly growing expectations of what he might do. But the biggest recommendation is that the team has enjoyed excellent results since he arrived. It may sound a little condescending of me to suggest that there was even more onus on him to perform miracles at Watford. I didn't see him there often enough to know for sure, but I would think that he is now in a side that can really take advantage of a situation where the opposition set their stall out to stop him ahead of everything else. I love to see his party-tricks as much as anyone else, but as part of the Liverpool team John is prepared to accept that if somebody comes along to spoil his party, then he may be successfully clearing the stage for others to step onto the centre-stage and perform their tricks.